If you are looking for a conventional cemetery, then you are in for a surprise. This cemetery is the oldest in Budapest and has been preserved almost as a heritage site since time immemorial. It is spread almost over 56 hectares of land and is also one of the oldest outdoor cemeteries in the country. The first burial that took place here was in the year 1929, which was almost after 2 years of its founding. After that, a lot of Hungarian noblemen have been buried here. Famous writers, statesmen, artists, composers, architects- people of a high reputation rest here after passing away. The sculptures of the statues is worth seeing as it is done with utmost precision. Guided tours are available. You can opt for one to visit the prominent graves of the cemetery. How popular is Kerepesi Cemetery? People normally club together Népliget and Raoul Wallenberg Szakközépiskola és Szakiskola while planning their visit to Kerepesi Cemetery. This place has special place in my heart. When I feel alone and lonely then I visit this place. I realize that our life is nothing just a drop of a water in this vast ocean of the peoples. Really worth visiting because you can see the burial place of many important persons of the Hungarian history here. Specially like to thanks to government for making this place so beautiful and peaceful. If you have any problems then visit this place it will obviously give you some calmness and your mind will become more peaceful. My best place in this lovely city. I think It shouldon everybody's bucket list, who all are visiting Budapest. Wonderful architecture and contains a lot of stories in it. You will find burial from ancient time till present. All the contemporary significant or Paramount personalities are buried here. I didn't expect a graveyard to be so great but it failed my expectations. Spread over a very large area. Very quiet and touching. Has a good green lawn. I really liked it. If you are visiting Budapest, dont miss this place. It was an amazing experience. Read about Deak Ferencz, Kossuth Lajos, Arany Janos and many other important figures` lives before coming. Also do not miss the interactive information board near the entrance. You learn a lot about Hungary`s history. You can also get a free english map at the entrance. Huge, really green! It is quite interesting as it has many people of historical relevance buried there, but also because of the many different mausoleums and tombs. There are some that are truly works of art. Quite underrated attraction (not indicated on the two maps I had), but a must see. 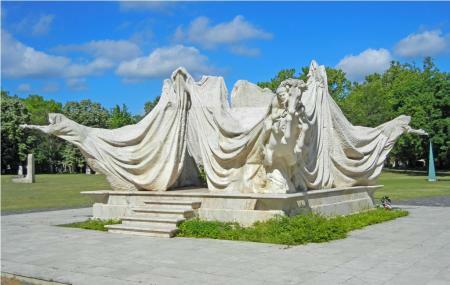 It's both a beautiful park and a piece of Hungarian history.